I’ve been using Strava for a few months now, so I figured it was time for an app review. Strava is a tracking app for both running and cycling, and so far, I’ve been pretty impressed. Strava does the same things that a lot of run tracking apps do: tracks time, distance, pace, keeps a record of your runs, elevation, splits etc. 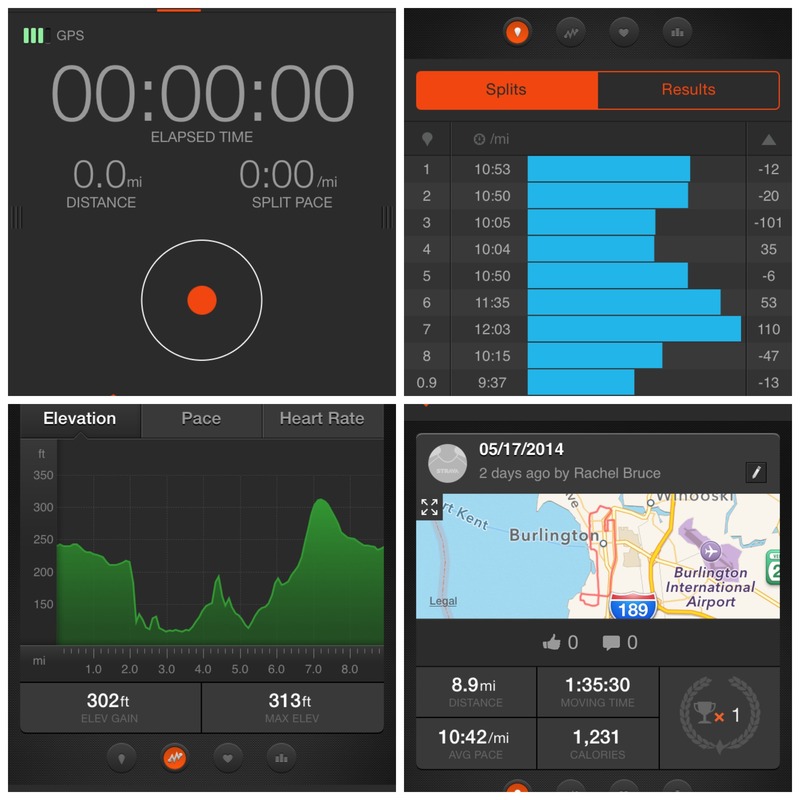 But of all the run tracking apps I’ve used, Strava has (in my opinion) the nicest interface. It’s easy to find the information you’re looking for, and to find it quickly. I used to love Nike Run+, but it was pretty limited in the amount of data you got out of it; particularly annoying was the lack of split times. Strava displays them for you right below the map of your run, and you can easily swipe sideways to view your elevation, and any achievements you scored during that particular run. I discovered Memorial Day weekend that when you run on a trackor area that the GPS can identify (Victory Field in Watertown, MA, for example), it will give you lap “segments” so you can compare your lap time. It also keeps track of other people’s laps on the same track so you can compete with others! The only problem I’ve had so far is that sometimes, even though the display will say I’ve run 9.0 miles, when I end my run and save it, it will save as only 8.9 miles. This is particularly frustrating when I’ve just run past my house 3 times in order to get to 9 miles, but my run is logged as only 8.9. This has happened to me often enough that I’ve actually taken to running an extra tenth of a mile just to make sure I actually get my scheduled mileage in my log. I will most likely continue to use Strava as long as I’m running outdoors. I’ve been really happy with it other than the silly tenth of a mile bug. Once winter hits, though, I’ll probably head back to the treadmill and back to Nike Run+, because it uses the accelerometer to track distance without GPS. Have you ever used Strava? Do you ever run by your house just to see a certain distance on your GPS? I haven’t tried it yet, but I do have it. My friend who bikes SWEARS by Strava. That same con tends to happen with Map My Run too. It’s very weird. I use the bike feature now on my rides to work–it’s pretty cool! There’s one known “segment” on my route and so I go as fast as I can on that part every day to try to move up. I’m currently #30. Guess I better keep working, lol! haha to doing the ‘run to hit the even mile’ thing! I have TOTALLY done that in the past, but now that I actively try to avoid looking at my stats while running I just take whatever I get … less stressful that way, especially since I know the basic length of my routes. I have Strava on my phone but keep using Wahoo Fitness because it is free for heart-rate pairing, and I use it with my Magellan Echo … but I love the looks of the Strava app! I also love how you can add all sorts of other information about shoes and so on. Thanks for the review! Never heard of Wahoo Fitness. I haven’t been wearing my HRM as much lately because the strap jabs me on longer runs, but it would be interesting to see how the HRM pairing with Strava does. However, I’m not willing to pay the premium rate to find out! I never heard of Wahoo until Magellan recommended it as the most robust app for their Echo watch, which does work also with Strava (but again, $60/yr for HRM? No thanks!). Ohh, I love that it tracks your laps, that’s a great feature! I use MapMyRun generally, but Strava sounds interesting… might be worth a try! I’ve definitely done the run-just-a-bit-longer thing to get a nice even number and then have my app save a shorter distance. Why the heck does that happen?! Drives me crazy. Me too! Just the dumbest thing.